We combine our graphics capabilities and industrial laser-cutting with the creative vision of customers like you. We really enjoy combining our graphics capabilities and industrial laser-cutting, but most products we make start with the creative vision of customers like you! It’s exciting when people think of unique ways to use Fotoforms laser-cutouts. We appreciate it when they think creatively about our capabilities, resulting in new products and uses. Below are some of our customer’s best, most creative ideas. Here's one of our favorite photo Cutouts! Don't worry, big brother is not hurting his sister. This hilarious photo Cutout is the result of great planning by the photographer. In the photo the girl is standing tip-toe on a box, which was removed from the final Cutout. Mouse over arrows to view additional pictures. Click on small images to view larger pictures. 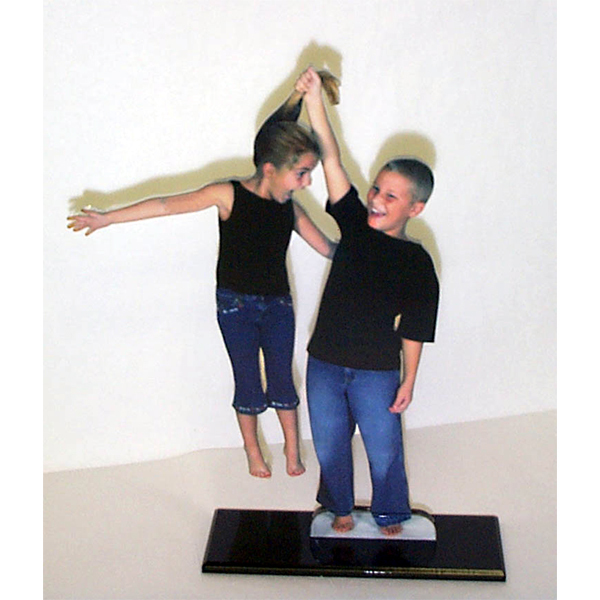 Fabulous Fotoforms works with your photos and graphics to create Photo Cutouts (also called Photo Statuettes or Picture Statuettes) Photo Trophies, 3-D Photo Popouts, Customized Photo Puzzles, Standard Photo Puzzles, and much more. We laminate, mount, and laser-cut your images to create unique,one-of-a-kind dynamic displays. Far better than framing and rectangular prints, Fotoforms adds an extra dimension to your graphics and images. Need help with design? Fotoforms offers graphic design services and can help design your graphics,or combine your graphics and images in ways that make your Photo Cutouts, Popouts, Customized Photo Puzzles, Photo Trophies really take advantage of our laser-cutting techniques and experience.